Student stress is at an all time high! What is the cause, and what can parents, students and educators do about it? 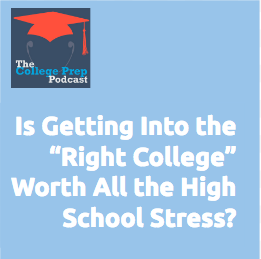 Join guest Mary Hofstedt from Challenge Success to learn about the results of an interesting research project on student wellbeing, and find out what parents, students, and schools can do to reprioritize student wellbeing without losing rigor, though college and beyond. If you’d like to explore sending a school leader or administrator to Challenge Success’s conferences, here is more information about the Summer Leadership Seminar. For whole school communities who are interested in getting involved, here is more information about the School Program. If you would like to read more research about college selectivity, the cheating epidemic, and more, check out these excellent White Papers. Mary Hofstedt, Ed.M., is a School Program Director at Challenge Success. In her role, she works alongside Challenge Success school teams to advance student well-being and engagement in learning, and provides interactive workshops to parents, educators, and students. Mary has an extensive background in curriculum and program design, positive youth development, leadership of school and community-wide initiatives to benefit youth, and social science research. She is the parent of a recent high school graduate and is passionate about working with others to ensure our young people thrive.